Posted on Sun, Apr 8, 2012 : 5:58 a.m.
Can something be both obvious and yet unthinkable at the same time? In the case of consolidating local governments or school districts in Michigan, the answer to that question has been “yes’’ for far too long. That is why no one should underestimate the significance of what is now underway in Ypsilanti and Willow Run. Last month, the two school systems announced that at some point in the near future, they will ask voters to allow them to consolidate into a single public school district. 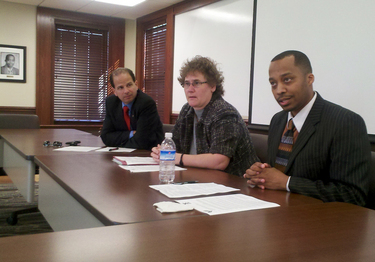 From left, WISD Superintendent Scott Menzel, Willow Run Superintendent Laura Lisiscki and Ypsilanti Superintendent Dedrick Martin announce plans on March 20 to pursue consolidating Willow Run and Ypsilanti school districts into one public school district. The announcement was not surprising, and yet at the same time, it was stunning. The potential benefits of consolidation seem obvious, but the resistance has always loomed even larger. We are, after all, a state that has 1,240 townships and almost 550 school districts. And people can be fiercely territorial about that tradition. That’s been as true in eastern Washtenaw County as anywhere else. For years, there have been leaders in both Ypsilanti and Willow Run who’ve quietly suggested that the two districts should merge. But nobody wanted to hit that hornet’s nest with a stick. So the status quo remained, even as the districts sunk deeper into debt and student achievement continued to flag. But that can’t continue, and the school boards and superintendents in both districts have been wise enough - and courageous enough - to doing something bold. By openly pursuing the idea of consolidation, they see the potential to emerge as a new district that is financially solvent and efficient and flexible enough to offer curriculum and programs that boost student performance. More importantly, through a voluntary consolidation, they can pursue these ends in a way that retains local control and input. In other words, without an emergency financial manager appointed by the state. That prospect is looming. Since 2009, both Ypsilanti and Willow Run have been on the state’s list of districts consistently running a deficit. Willow Run’s deficit is currently $1.7 million, while Ypsilanti’s total projected deficit tops $9 million. Already, the state has emergency managers running schools districts in Detroit, Highland Park, Benton Harbor and Muskegon Heights. It’s not as if Ypsilanti and Willow Run haven’t been cutting their budgets, and looking for ways to save money by consolidating services like busing or back-office functions. But what leaders in both districts have concluded is that nothing short of profound, transformational change will pull them out of their downward financial spiral. Necessity has compelled them to consider something as dramatic as full consolidation. And they look like good candidates for that. Sitting side by side, with a potential combined enrollment of 5,300, they share the same financial constraints, the same academic challenges and, to considerable degree, the same students. A recent AnnArbor.com report showed that under schools of choice, more than 700 students who live in the Willow Run district were attending Ypsilanti schools last year, and 172 students from Ypsilanti were attending Willow Run schools. It’s not uncommon for students to bounce back and forth between the districts because of changes in their situation at home. A single, consolidated district with the same programs and standards could better serve all students. We understand that the districts are extremely early in this process. Both school boards have approved resolutions in favor of exploring consolidation, and they’ll meet jointly next week to discuss the next steps. Undoubtedly, what officials have ahead of them is a great deal of planning, hard work and attention to community input. They are also going to need considerable assistance from the state Department of Education and the Legislature. Gov. Rick Snyder has targeted funds in the state budget to support consolidation efforts across Michigan, and the effort being undertaken here would benefit from being able to tap into that money. But as radical as something like consolidations can seem, it’s also logical and perhaps even inevitable. We commend the leaders in Ypsilanti and Willow Run for taking the first steps, and we encourage everyone who has a stake in this process - be it students, staff, parents or community members - to approach this effort constructively and with an open mind. As hard as change can be, not changing is the least viable option for these two districts going forward. Wed, Apr 18, 2012 : 11 p.m. Consolidating schools is often cheered as a solution to budget woes etc., but in reality it is a failure to properly fund schools and budget. More schools create diversity and is good. Less schools/consolidation destroys school diversity and reduces the culture of children's education. We should be fighting to keep as many schools as possible open....but of course this would require better funding and the willingness of the general public to preserve the heritage of Willow Run/Ypsilanti Schools etc. We seem to be heading for one mega-high school and one mega-elementary school for each of our communities....not good. School mono-culture. The public needs to be better educated on the value of preserving public schools. The health of our public schools is a strong indicator of the health of our democracy. Thu, Apr 12, 2012 : 7:19 p.m. I attended the Willow Run Schools in the late 1960s thru the mid 1970's (my family ultimately moved to Saline where I completed high school). What is clear to me is that Willow Run's problems predated school of choice, funding problems, bad economy, etc. The district obviously always faced a number of socio economic issues relative to its student base, but the bigger problem was that it was just sub scale in many areas and it wasn't able to offer enough to kids who were struggling with school nor could it offer a real challenge to kids who were looking to go to college. My sense (admittedly from a 35 year distance of attending Willow Run) is that the merger with Ypsilanti could help address some of this issues and may in fact allow the new district to offer a range of services that neither can alone. I do have fond memories of many excellent and committed teachers in the Willow Run school system and I wish the students and faculty of both districts good luck as this progresses. Mon, Apr 9, 2012 : 3:28 p.m. So here is the thing: Some may think this is logical but I don't. Some may think this is 'bold' but I don't. Logical would be combining these schools with successful or more competitive districts to improve results instead of combining two noncompetitive and under-performing schools. Bold would be closing these schools down sending the kids to other schools districts in the county or making a county-wide school district under WISD so that schools, special programs, and services could be chosen on a county-wide basis. Consolidation of these two school districts is an interim step to something else. Parental/Student flight will continue and possibly increase resulting in the same budget issues that prompted this consolidation. My hope is that somebody is really thinking of something that may actually solve the problems in these districts for the step after this one. Mon, Apr 9, 2012 : 5:15 a.m. This editorial would have a lot more credibility if I were told Mr. Dearing lived in the district and had children attending these schools. Mr. Dearing -- is there anyone on the editorial board who lives in the district and have children attending school there? It's always interesting to observe people proposing big changes for communities where they don't live. Where their lives and their children aren't part of the 'logical' and 'inevitable' change editorials like this urge. I suspect if it were their community and their children involved there would be a lot less enthusiasm. I suspect there would be an editorial urging 'caution' and that this was a 'flawed' plan needing 'further research'. Substitute 'consolidation of Ann Arbor, Ypsilanti and Willow Run schools' into this story (consolidation is good so more consolidation must be better, right?) and let's see how people feel. Mon, Apr 9, 2012 : 2:24 p.m.
Mon, Apr 9, 2012 : 2:15 a.m.
Ypsilanti and Willow Run currently receive different levels of per-pupil funding from Lansing. How will this be addressed under consolidation? I can see real potential benefits to consolidation, but the rules they make in Lansing may determine if it actually makes sense or not. Mon, Apr 9, 2012 : 12:35 a.m. I hope this works, but my fear is that this could back fire too. I wonder how many families will opt to leave the Ypsi, Willow Run schools altogether. There is a sentiment in Ypsilanti that Willow Run is rock bottom and they wouldn't want their kids with the WIllow Run kids. Sun, Apr 8, 2012 : 5:59 p.m.
Sun, Apr 8, 2012 : 5:46 p.m.
One of the biggest problems with public education in Michigan is &quot;multiple juridictions&quot; each with their own costly political and administrative infrastructure. We could hire three or four master teachers for each school superintendent eliminated by consolidation. When other postitions are considered, the power of consolidation becomes even more compelling. Why do we need two personnel directors, two financial administrators, etc, etc, or two complete sets of ego involved school board members when one will serve? States where the county is the typical administrative unit for public school systems have a whole different cost structure. The problem is, vested interests block every effort to make rational decisions. Mon, Apr 9, 2012 : 1:22 a.m.
Monica, In Ypsi school board members are volunteers, they get no pay and some of them work really long hours, reading documents, studying up on issues, etc. E. Daniel, In today's economy, where have ones at the top of our 'employment food chain'...i.e.-the administrators, elected school district leaders, H.R. Directors cut themselves to save money and financial resources? So far, cuts have occurred far down the 'soup line'....school janitors, secretaries, lunch personnel, bus drivers and a bit up the line with school teachers. It will be interesting to see if School Administrators/School Boards will cut themselves with this 'consolidation' methodology, or just cut the quality of services again while calling for another 're-invention'. Sun, Apr 8, 2012 : 5:38 p.m. The inevitable end result of the proliferation of for-profit &quot;charter schools&quot; that are allowed to cherry-pick the students that are the most profitable for them has been that inner-city public schools have become the dumping ground for three types of students: those with behavioral issues, those with learning challenges but don't qualify for extra funding from the state, and those that lack the means to transfer out to either charter or better-performing districts- either they lack transportation, or their parents just don't care- so they find trapped in schools where an increasing percentage of other students have no respect for authority and no interest in academic achievement. How sad that our supposedly civilized yet increasingly self-centered society has chosen to just write off thousands of kids like this. The only thing we've accomplished through this experiment in schools of choice is the transformation of our inner-city public schools into warehouses for poor kids that have no chance of a better future. Its' sad to read that this day will be soon to pass. Despite nasty comments by Ron G. above IMHO, Ypsilanti Public Schools provide a solid educational founding for many years. What happened? Schools of choice, too many so-called 're-inventions', years of lack of discipline in the late 1990's-2000's which was sad to hear, years of suspension nation after the lack of discipline which left students were they didn't need to be -out of school-, questionable leadership some of those years -'True Braves miss Mr. Beaudette' &amp; changing the school name which assisted the a loss of identity. I fail to see were this latest 're-invention' will do the trick. Less examine the facts. For the last several years Ypsilanti Public Schools and Willow Run have been losing students to Charters, Van Buren, Ann Arbor and in some cases Lincoln Public Schools. Both school districts have struggled with the 'magical NCLB' as only test of measurement, the standardized test. Many years of teaching standards an laser-like focus for the 'test' instead of teaching for the students, have failed both districts. As for the students transferring 'at will' between both schools, this going to change with consolidation? No, because instead of transferring between YPS and WRHS, they'll just transfer out of new 'combined' districts all together. Guess Ron G. better be prepared to move to Gross Pointe Farms School District to achieve his version of 'singularity in numbers and outward appearances'. Today, children are way too distracted. Think about it. Between their cellular phones, texting, Facebook (which must be constantly updated you know... sarcasm), Twitter feeds, reality television and parents stressed daily too make ends meat in this economy, teens which are still children (just taller ones) are pressured to be mini-adults way too soon. So, we're led to believe the combine monetary 'deficits' be solved by consolidation &amp; all problems will be magically solved. I for one, doubt it! Sun, Apr 8, 2012 : 5:35 p.m.
JNS 131, Your 'racial biases' are slowing like two bulls horns. First, Van Buren is a good school district with a fine principal leading the high school Mr. Van Tassel. Second, part of West Willow (cross Tyler Road) has been in Van Buren School District since the district was formed. Third, JNS 131 you might want to take a look around because Southeastern Michigan 2010 and beyond will not look or feel like S.E. MI of 2005 backwards. Here are some facts that for racially bias individuals like yourself, might constitute a move to South or North Dakota to achieve your version of 'race homogeneously'. In the next five to ten years, Detroit and its' current population will continue to be pushed out of the city, probably right into the area you hold so dear. Why? With the Consent Agreement, next step for corporate friends and family of Rick Snyder is to get hold of valuable property surrounding Detroit's River Front. Next, stage include buying distressed properties/land in the city. From there, they must raise market rents, leases and home purchase values to encourage in a silent ethnic and racial 'clean up' of the area. Guess were residents in Detroit are going to go when the city becomes un-affordable or uncomfortable? Right to suburban areas and school districts you hold so dear. So JNS 131, take my advice. Pack up your belongings now and move to North or South Dakota. Save yourself from living and enacting on a daily basis with people different from your racial identity. Southeastern Michigan changing racial and ethical demographics are coming to a town near you or worse, your 'cul-de-sac'. Oh the horror! Sun, Apr 8, 2012 : 5 p.m.
Van Buren does have Ypsi problems and WR problems. If Van Buren did consolidate with Ypsi and WR it would join the ranks of Detroit and other lower performing schools. Especially since it does have some West Willow Children over there. Good luck, glad Ann Arbor is staying away from the consolidation gig. Sun, Apr 8, 2012 : 4:33 p.m.
Dear Ron Granger, I am delighted, absolutely DELIGHTED, that you hold Ypsi in such low esteem, and that you like to trumpet your small-minded opinions in public fora like Ann Arbor.com, especially if it means that bigots like yourself will not set foot beyond the &quot;green zone&quot; and invade our lovely little town! Mon, Apr 9, 2012 : 11:28 a.m.
thank you Miss Ypsi, I could not have said it better myself. Sun, Apr 8, 2012 : 2:40 p.m.
And so why isn't Ann Arbor ISD, or even Lincoln considering consolidation with Ypsi? They share many students as well. Mr. Dearing isn't addressing the 800 pound gorilla in the room. Sun, Apr 8, 2012 : 5:14 p.m. The 800 pound Gorilla in the room is the racial make-up of both schools districts. Its' sad that in 2012, we as a society are still focused on 'if my kids go to school with others of a different race, the educational quality will decrease'. Let's be real here. Combining Ypsilanti &amp; Willow Run Public Schools aren't going to solve problems these 'closed-minded' thinkers (see above) believe. Instead, it will push more children out of 'Ypsi-Willow Run P.S.' or whatever its' called, and into Ann Arbor, Lincoln, Saline (in some cases), Milan, Van Buren Public Schools and Charters, of course. Why? Again, because of transferring between schools, parents will just transfer their kids out of the district altogether. Also, for 'closed-minded thinkers' don't want these children into their 'race homogeneous' school districts, it will be a little too late. Society, racial and ethical population statistics are changing rapidly in Southeastern Michigan. It appears some individuals need to learn how to deal with this, or consider a move to North or South Dakota. Sun, Apr 8, 2012 : 4:57 p.m. I really hope Ann Arbor never joins with Yps or WR. These two districts need to bring up their levels of excellence before ever joining a top level ranking school district such as Ann Arbor. As for Lincoln? They are considering it but nothing definite as of late. I do know a few middle and hi schools are in the top 25 and 50 in Ann Arbor. Hate to say it, but I hope these schools start giving Ann Arbor a run for its money in say 10 years? Sun, Apr 8, 2012 : 3:55 p.m. Many of us consider Ypsi a failed community on just about every level. So why would Ann Arbor taxpayers want to fund Ypsi schools, or be in any way connected? Why would Ann Arbor parents want their kids exposed to any aspect of &quot;that which is Ypsi&quot;, or Willow Run? Or, by extension, Detroit? A lot of us live in Ann Arbor because it is not Ypsi, Willow Run, or Detroit. Sun, Apr 8, 2012 : 3:20 p.m. They will be joining the conversation soon. Its a shame more resources will be wasted in the next round of restructurings! Sometimes I think the biggest barrier to a quality education and government is egos, unions, politicians, agendas. I'm surprised local cities and townships aren't at the very least discussing merging! Sun, Apr 8, 2012 : 1:35 p.m. It kinda sounds like it is turning into one giant cooridor of sprawl - maybe even a tentactle - to Detroit. I just hope the green zone can protect us in Ann Arbor! Sun, Apr 8, 2012 : 9:08 p.m.
Ron, was that comment supposed to go on another article? I can't understand what you're commenting on otherwise. Sun, Apr 8, 2012 : 11:50 a.m. It certainly is logical. Now we wait and see if either - not to mention both - school board will stop talking long enough to actually do something.